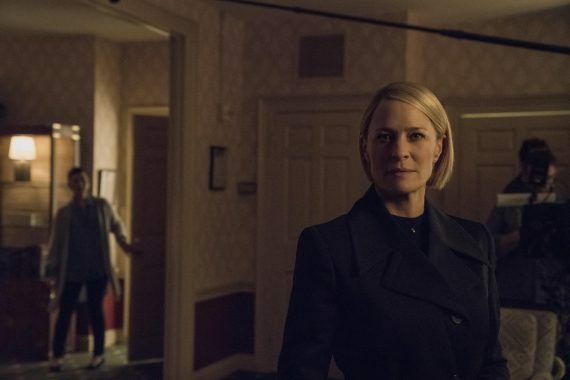 Golden Globe winner and Emmy Award nominee, Robin Wright, returns as President of the United States, in the sixth and final season of the award-winning landmark series, House of Cards. The final season of House of Cards returns to Netflix later this year. Academy Award® nominees Diane Lane and Greg Kinnear as well as Cody Fern join Wright this season, alongside Emmy Award nominee Michael Kelly, Jayne Atkinson, Academy Award® nominee Patricia Clarkson, Emmy Award Nominee Constance Zimmer, Derek Cecil, Campbell Scott, and Boris McGiver in the sixth and final season. House of Cards executive producers are Melissa James Gibson, Frank Pugliese, Robin Wright, David Fincher, Joshua Donen​, Dana Brunetti​, Eric Roth​, Michael Dobbs​ and Andrew Davies​. The series was created by Beau Willimon​ and is produced by Donen/Fincher/Roth, with MRC as the studio, for Netflix. In 2013, House of Cards became the first original online series to receive major nominations from the Primetime Emmy Awards. The series has received 53 Emmy nominations to date, with seven wins — including the first major Emmy for a streaming service for David Fincher’s win for “Outstanding Directing for a Drama Series.” House of Cards received six Golden Globe nominations, and two wins. The historic series has received 11 Screen Actors Guild nominations with two wins; an AFI Award; four Writers Guild Award nominations, with one win; two BAFTA nominations; four Producers Guild Award nominations; two Directors Guild Award nominations; and a Peabody Award, among other accolades.